Efficient storage is an important part of keeping your home exercise equipment organized and ready when you are. The CAP Barbell 1" Plate Tree has a brilliant design that combines durability with compact size. This weight plate tree can accomodate any 1" barbell plate and is designed to fit easily even in small rooms. 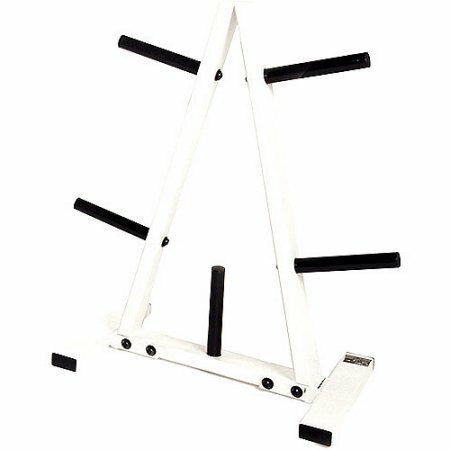 The CAP Barbell 1" Plate Tree is perfect for improvised workout areas such as dens, basements and garages. The CAP Barbell 1" Plate Tree is durable enough to hold your 1" plates and has a powder-coated finish that looks sharp. Now you can keep your weight plates organized and ready for use more easily than ever. Whether you're an exercise guru or a novice weightlifter, the CAP Barbell 1" Plate Tree will help you make the most of your training. If you have any questions about this product by CAP Barbell*, contact us by completing and submitting the form below. If you are looking for a specif part number, please include it with your message.